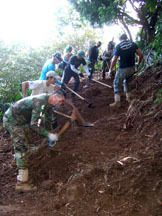 The spectacular hiking trail between Keʻe Beach and Hanakapiʻai Beach on Kauaʻi’s Napali Coast needs your help! 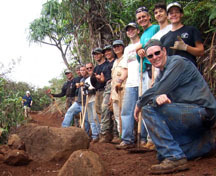 Twice a month, the Friends of Kalalau Trail organizes volunteer workdays help rehabilitate degraded portions of this two-mile stretch. The views are stunning and the company delightful—click here to join them. Using picks, shovels, hoe-rakes, and lots of muscle. Turning the worn trail into a smooth, wide treadway.